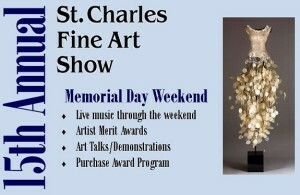 This May marks the 15th annual St Charles Fine Art Show. The art show is put on by the Downtown St Charles Partnership which is a volunteer organization dedicated to the ongoing revitalization of downtown St Charles. The Downtown St Charles Partnership is also responsible for putting on the St Charles Jazz Weekend, Holiday Homecoming, and St. Patrick’s Day parade. The Downtown St Charles Partnership is predicting that this years art show is going to be their largest. There will be over 100 artists displaying art in various medium such as watercolor, oil, sculpture, photography, jewelry, ceramics, fiber, wood, and glass. The St Charles Fine Art Show is a juried show, meaning the artists must submit pictures or samples of their work for approval before their work can be displayed for purchase. A juried show tends to draw more serious artists which in turn attracts the serious art buyers. The result is a very popular show with both artists and buyer that withstands the test of time. The partnership has a program designed to get buyers to commit to making a purchase through their St Charles Fine Art Show Purchase Award Program. By pledging to spend a minimum of $250 you get admission to an invitation-only reception the Friday evening before the show, where you will have the opportunity to meet the artists and see a sample of their work and admission to the Purchase Award Sponsor tent during the two-day event, where you can relax and rejuvenate during show hours. AAA Insurance is primary sponsor of the 15th Annual St Charles Fine Art Show. There will be family events such as a family photo booth as well as live artist demonstrations and an art talk. You will be able to see live musical entertainment sponsored by the Kane County Chronicle. Throughout the weekend you will be able to see live musical entertainment sponsored by the Kane County Chronicle. All Fine Art Show activities are free to the public and people of all ages are encouraged to attend. The feature tent is presented by STC Capital Bank and features “The Art of Weaving” by Fine Line Creative Arts Center in St. Charles. The artists from Fine Line will showcase a loom, knitting machine, felting, basket making, and more. The St Charles Fine Art Show takes place May 25 and 26 and is located along Riverside Avenue (formerly 1st avenue) between Rt. 64 and Illinois Avenue. On the 25th it starts at 10am and runs through 6pm and on the 26th is starts at 10am and runs to 5pm. Even if you are not “into” art this can be fun family outing right in the heart of the Fox Valley. I look forward to see you there.